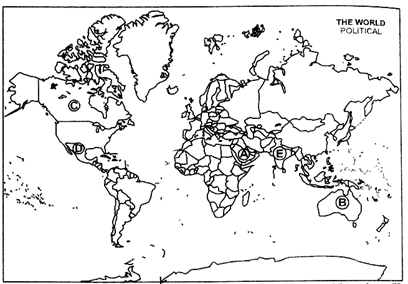 question_answer1) Highlight any one feature of the multi-polar world as visualised by both Russia and India. question_answer2) What was the significance of 'Operation Iraqi Freedom'? question_answer3) Give a suitable example to show that globalisation need not always be positive. question_answer4) Why does development have different meanings for different sections of the people? question_answer5) Why is violence between two communities considered as a threat to democracy? question_answer6) In which way did the policy of Non-Alignment serve India's interests? question_answer7) Analyse the two political developments of 1940s that led to the decision for the creation of Pakistan. (a) Indira Gandhi (i) A Member of Parliament from 1952 till his death. (b) Ram Manohar Lohia (ii) Symbol of opposition during emergency of 1975. (c) Jai Prakash Narayan (iii) Nationalization of banks. (d) Jagjiwan Ram (iv) Best known for his sharp attacks on Nehru. question_answer9) How far did the Rajiv Gandhi - Longowal Accord succeed in bringing normalcy in Punjab? question_answer10) What will happen if the region are not given their due share in decision-making at the national level? question_answer11) What was the main objective behind China's adoption of the Soviet model of economy? In which two ways was China benefitted by it? question_answer12) Describe terrorism as a new source of threat to security. question_answer13) Explain any four negative consequences of globalisation for the people of India. question_answer14) Highlight any four consequences of the partition of India in 1947.
question_answer15) What distinguished the dominance of the Congress Party in India from the one-party dominance in other countries? Explain. question_answer16) Examine the dramatic changes that took place in the party system in India during 1969 to 1977. The smaller states in the alliances used the link to the super powers for their own purposes. They got the promise of protection, weapons and economic aid against their local rivals, mostly regional neighbours with whom they had rivalries. The alliance systems led by the two superpowers, therefore, threatened to divide the entire world into two camps. This division happened first in Europe. Most countries of Western Europe sided with the US and those of Eastern Europe joined the Soviet camp. That is why, these were also called the ''western' and the 'eastern'' alliances. (i) Name one organisation each related to the 'western' and the ''eastern' alliances. (ii) Why were the smaller states interested in joining the super alliances? (iii) How did the 'alliance system' threaten to divide the world? The lack of genuine international support for democratic rule in Pakistan has further encouraged the military to continue its dominance. The United States and other Western countries have encouraged the military's authoritarian rule in the past, for their own reasons. Given their fear of the threat of what they call ?global Islamic terrorism? and the apprehension that Pakistan's nuclear arsenal might fall into the hands of these terrorist groups, the military regime in Pakistan has been seen as the protector of Western interests in West Asia and South Asia. (i) What is meant by 'global Islamic terrorism'? (ii) Why did Pakistan lack genuine international support for democratic rule? (iii) Why was the military regime in Pakistan considered as the protector of Western interests in West Asia and South Asia? Critics of popular movements often argue that collective actions like strikes, sit-ins and rallies disrupt the functioning of the government, delay decision-making and destabilise the routines of democracy. Such an argument invites a deeper question: why do these movement resort to such assertive forms of action? We have seen that popular movements have raised legitimate demands of the people and have involved large scale participation of citizens. It should be noted that the groups mobilised by these movements are poor, socially and economically disadvantaged sections of the society from marginal social groups. (i) Popular movements resort to which two types of assertive actions? (ii) How far do you agree with the arguments given by the critics? (iii) Why are groups involved in popular movements mostly from marginal social groups? (i) Identify and name the person who is holding the balancing beam between the public sector and the private sector. 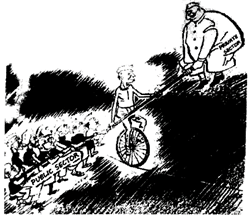 (ii) Why has a big tilt towards the public sector been shown in the cartoon? (iii) How did the over-emphasis on public sector adversely affect the Indian economy? (i) The country where Montreal Protocol was signed in 1987. (ii) This country is of the view that the major responsibility of curbing gas emissions rests with the developed countries. (iii) This country is known for its forest movements. (iv) The first anti-dam movement aimed to save the Franklin River and its surrounding forests was launched in this country. (v) The largest producer of mineral oil in the world. Highlight the circumstances which gave birth to the idea of New International Economic Order (NIEO). Explain any two factors that weakened this initiative. In what three ways did the collapse of the Soviet Union affect the world politics? Explain. Examine the U.S. hegemony as a structural power. Mention the six principal organs of the United Nations and describe the functions of any two of them. Do you agree with the statement that 'the foreign policy of independent India has pursued the dream of a peaceful world'? Support your answer with any three suitable arguments. Give any three suitable arguments in favour of ?India being a staunch supporter of the decolonization process and in firm opposition to racialism?. Highlight the acts of dissent and resistance of the Emergency imposed in 1975. In your opinion, how did these acts affect the public opinion? Describe any three areas of tension which are yet to be solved to retain unity in diversity in India. Describe any three elements of growing consensus among most of the political parties of India after 1989.